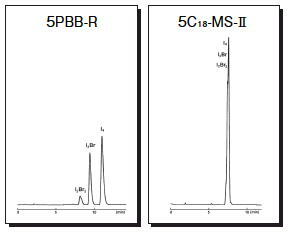 COSMOSIL PBB-R strongly retains iodine atom which has a large dispersion force, than bromine atom. So it can separate halogen exchange reaction products that are difficult to analyze with C18 column. C18 column can not separate Triton X-100 mixturem, because (-OCH2CH2-) group has little hydrophobicity. 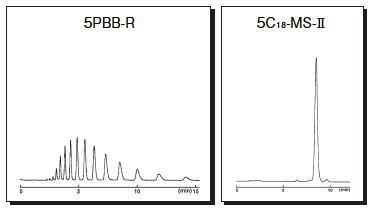 However, COSMOSIL PBB-R can separate them because it distinguishes difference in the dispersion force, which depends on its molecular weight.